Something about Star Wars and modelling just seems to go together. Maybe its all the books I read as a kid about the ILM Model Shop and Creature Factory and seeing all those lucky guys playing with big Star Wars ships that did it. As soon as Bandai started advertising the new Star Wars collection I knew I had to have them. For a while you could order them from places like HLJ but once Disney took over the franchise (for a staggering $4bn) they put a stop to that quoting the fact that Revell has the franchise rights for Europe. The fact that Revell don’t do the same subjects, and therefore there was no competition for Revell, seemed to be missed by all. I had bought quite a few, well all, of the available kits before the Disney block and as a result I already had quite a few of the kits from the 1:12 figures to the vehicles like Snowspeeder and AT-ST walker I modelled here. I had an idea to do them together for a while but for some reason lost the thought until I saw a promotional artwork for the Star Wars: Battlefront game releases a few months ago. It showed a crashed Snowspeeder and all of a sudden the thoughts of doing the Snowspeeder and AT-ST together was resurrected. Anyone who knows Star Wars kits knows Bandai. They stunned the modelling world with the first few releases, which were mostly figures. Once the ships started flowing I think the Star Wars geeks went crazy. They are often compared to similar kits produced a while ago by Fine Molds. Having built a few of both (and both the Fine Molds Snowspeeder and the Bandai one) I’d say the comparisons are fair. For those who don’t know the kits there is a description below of each. Both of the Bandai kits featured here are both 1:48 scale and are a really nice size for those who want to build dioramas. Sure I would love to see them both in 1:35 but for what I wanted to do here its perfect. The level of detail is great, they come modelled in colour (Bandai also somehow manage to put clear and coloured pieces on the same sprue!) and come with both decals and self-adhesive stickers. Its plain to see that they aren’t pitched at the expert modeller and can look really great from the box, if a little toy like, but the fit is great and the possibility to do other things with them is endless. For someone who wants to go further though they form a really good basis for painting and weathering. One word of warning though. A few people have reported that the plastic on some kits doesn’t play well with enamels and oils without a basecoat so be warned if you want to weather the kits without painting them first. 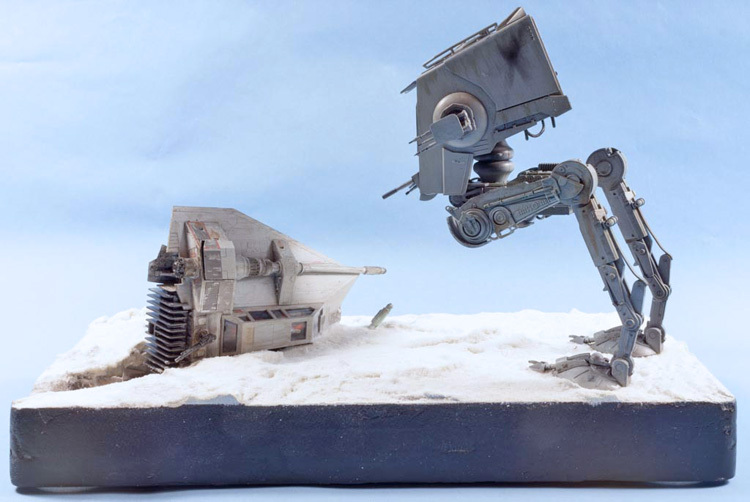 The All Terrain Scout Transport (AT-ST). “The All Terrain Scout Transport (AT-ST), also known as a Scout Transport, Scout Walker, or derisively as a chicken walker, was a lightweight, bipedal walker used by the ground forces of the Galactic Empire.